Valentine’s Day is on Thursday, Feb. 14th. Valentine’s Day can be an excellent opportunity for couples to enjoy an evening out but often this lover’s holiday is met with apprehension. It’s not always easy to go out without a reservation, is there a babysitter available, or it simply doesn’t feel like an inclusive holiday for everyone, coupled or not, to enjoy. Well, The Lake Club is offering a full weekend of specials and live music allowing you to decide the best time to celebrate and with whom. 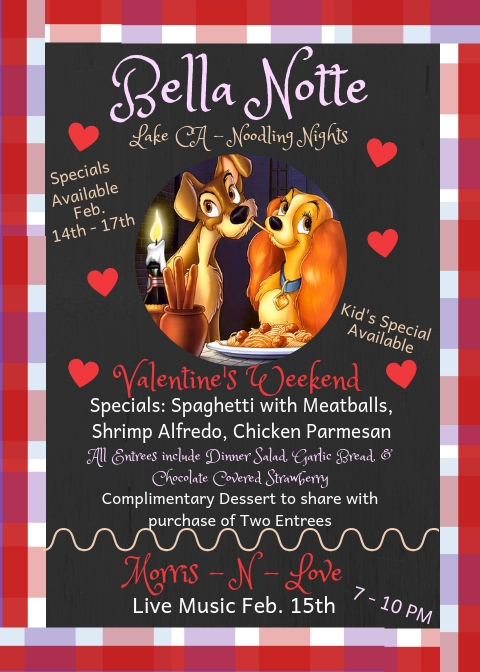 Feb. 14th – 17th, we will be serving up Lady and Tramp inspired specials. All entrees include a salad, garlic bread, and chocolate covered strawberry. A complimentary dessert to share is included with the purchase of two entrees. We also have a kid special available so that you can celebrate with the whole family. Charming Charles moved to perform on Feb. 14th in The Lounge from 6 to 9 PM. Morris – N – Love will be live at The Lake Club on Feb. 15th from 7 to 10 PM. Morris – N – Love are a Lake CA favorite as they always put on an amazing show. They will obviously play some love songs for a little slow dancing, but there will be plenty of music to get everyone off their feet and moving. So, bring your lover, bring a friend, or meet someone new at The Lake Club Valentine’s Weekend.